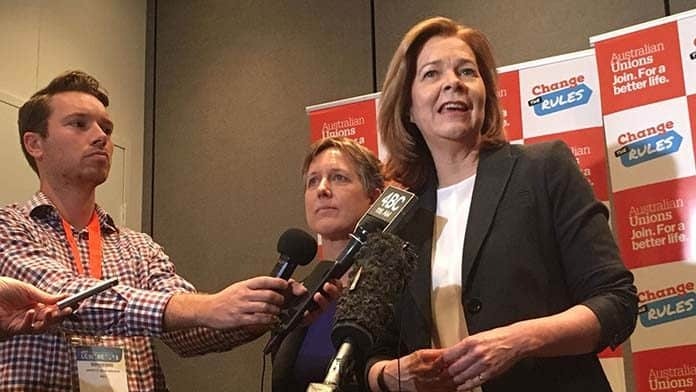 The ACTU Congress in July spelled out the union movement’s demands for change on industrial relations, targeted at influencing an incoming Labor government. There was very little debate at the Congress, with the decisions already finalised by union leaders in the months leading up to the event. On the first morning, Congress voted in Michele O’Neil, former Secretary of the Textile Clothing and Footwear Union as ACTU President, replacing Ged Kearney. The new ACTU President quickly earned the ire of the Murdoch press. The Australian bemoaned O’Neil’s “militant” industrial stand, while The Daily Telegraph’s front page screamed, “Unions Bully Bill on Boats”, pointing out that the ACTU’s refugee policy on both offshore processing and turning back asylum boats is at odds with Labor’s position. ACTU Secretary Sally McManus told Congress that enterprise bargaining was failing. In response its policy calls for the right to sector or industry-wide bargaining—backed up by strike action. Such a shift could address the way enterprise bargaining has weakened unions through dividing workers up at an individual company level. The ACTU also wants far-reaching changes to remove restrictions on strike action. Its policy calls for the removal of the Fair Work Act’s requirement for secret ballots before strikes, the scrapping of penalties for taking industrial action, an end to ministerial powers to terminate industrial action, and the prohibition of employer lockouts. Unions’ right of entry to workplaces would be improved by scrapping the requirement to give 24 hours’ notice. However, the clause that led to the outlawing of the NSW train drivers’ strike (that it posed a threat to the welfare of part of the population) is retained. Moreover, while the policy states that workers should have the right to take industrial action for any industrial, economic or political objectives, it does not clearly challenge the framework of enterprise bargaining. This bans any industrial action outside limited bargaining periods every three or four years as “unprotected action”. While the policy calls for an end to the laws against secondary boycotts, if only protected action is permitted, solidarity strikes would remain unlawful. The ACTU also wants to pursue increases to basic Award conditions, and to scrap the compulsory Award Review process, which led to the cuts to penalty rates. It calls for measures to address casualisation through enshrining equal rates of pay for labour hire workers, limiting fixed term contracts to two consecutive fixed terms, and broadening the definition of casual workers to include new sectors such as bicycle delivery drivers. It also endorsed industrial manslaughter laws, removing the restrictions on what can be included in enterprise agreements, and an end to employers’ ability to terminate agreements. But the ACTU’s position on temporary visa workers is a hotchpotch–it uses the “Aussie jobs” demand to blame foreign workers for unemployment alongside supporting efforts to organise temporary workers into our unions. This was contested by an excellent presentation from the National Union of Workers (Victoria), which included migrant workers who are organising for wages and conditions in the agricultural sector. Labor has already promised changes in a number of areas the ACTU has nominated. Bill Shorten’s speech to the Congress dinner was cheered by many when he announced the abolition of the ABCC, as well as changes to force employers to pay labour hire workers the same as direct employees. Labor also says it is considering other changes including around industry bargaining. Despite their limits, the ACTU’s policies show the scale of the changes needed to deliver the right to strike. But its Change the Rules campaign is focused on campaigning in marginal seats with a view to getting Bill Shorten and Labor elected. There was no discussion of any industrial response through ongoing stopwork demonstrations—like the one in Melbourne that saw 120,000 march in May. Labor’s final policies will go nowhere near restoring an unrestricted right to strike, something it has already ruled out, or accepting the full scope of the union movement’s demands. Given our very recent experience, when six years of Rudd and Gillard governments left Work Choices largely untouched, we need a determined fight that is ongoing regardless of who wins the next federal election.